Spring is finally here and the weather is starting to get warmer–yay! I don’t know about you, but I want to spend as much time as possible outside, enjoying the nice weather. There are some fun things to do here on campus, but there are even more ways to enjoy the weather out and about in Columbus. You could explore German Village, attend a Columbus Clippers baseball game, or take a walk through Goodale Park. Now, you may be thinking, “I don’t have a car, how am I supposed to get there?” You have lots of options! The one option you are probably most familiar with is the COTA. This is the public bus system in Columbus, and you get to ride for free with your BuckID. The bus I use the most is the #2; it goes straight up and down High Street, making it easy to get downtown. If you plan on spending a lot of time out and about in the city, you might want to look into car2go. You have probably seen the blue and white Smart cars around campus. You can sign up for car2go with a onetime fee, and then pay $0.41 per minute of driving. When you are ready to go somewhere, just find a car, use your member card as a key, and drop it off in a designated space when you are done. This is an easy way to get where you want to be on your own time. My favorite option is the University-affiliated bike share program! It is just $35 per year, or $6 a day, but there are additional fees for longer rides. You can download their app on your phone, and then when you want to ride you just tell the app the bike number you want, and you will get the code to unlock the bike. You can take these bikes to class or to a fun off-campus location. This is a great way to get some exercise, enjoy the weather, and explore Columbus! There are so many cool places you can ride including the Olentangy Trail and Scioto Mile. 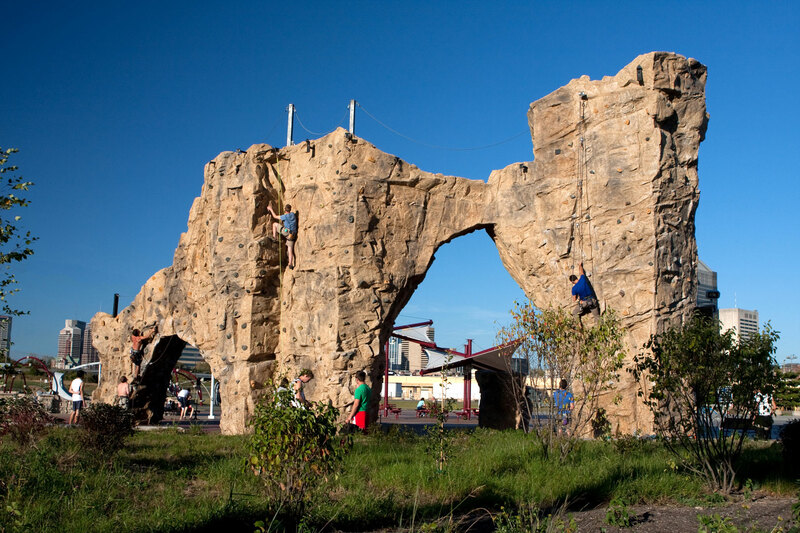 I also recommend checking out the Scioto Audubon Metro Park–they have a pretty awesome climbing wall. With finals week approaching, Thompson Library can get pretty full, and sometimes it is hard to find a seat. However, no need to worry: Ohio State features many other great study locations on campus! All of the residence halls have places for students to study, with 24-hour quiet hours during finals week. If you live on campus, this is super convenient because there is no reason to leave the building. I recommend studying in your building if you plan on being up late; that way, you don’t have to worry about walking back alone in the dark. 18th Avenue Library is great because it is open 24 hours. Nobody is going to ask you to pack up and leave when you are on a roll. Whether you are planning on studying all night or just stopping in between classes, this is a great location! The space above 12th Avenue Bread Company (adjacent to Kennedy Commons) houses a study room with some large tables and some comfy chairs. There are rarely many people there and it stays pretty quiet. I find this to be a great place to spread out if I have a lot of papers and books. And once you are finished studying you can reward yourself with a great meal from Kennedy! If you don’t mind a little noise, the cafés can be a great place to get some studying done and enjoy a nice cup of coffee. My favorite is Connecting Grounds on north campus because not only is the coffee delicious, but the chairs are super comfy. There is another great study room in Smith Laboratory. This room has a lot of tables and chairs, as well as a ton of outlets to charge your computer. There are also some great group study rooms here. Check this out when you need a change of scenery! If none of these places are your cup of tea, you can find the whole list of campus libraries–as well as extended hours for finals week–on the University Libraries website. I’m sure you can find library that works well for you! If you are living in a residence hall, you’ve learned by now that you are surrounded by many other students living on your floor, many of whom are new just like you. If you are just hanging out in your room, leave your door open. As people walk by, invite them to join you. Who knows, your new best friend could be living down the hall! If you get to class a few minutes early, introduce yourself to the person next to you. Maybe you will make a new friend, or–at the very least–a new study buddy. The First Year Success Series is also a great place to introduce yourself. Everyone in attendance at your session will be a first-year student, too, and since you all selected the same session, you already have something in common! Ask a student why they choose the particular session–it could be a great conversation starter! Everybody has to eat, so next time you are heading out for a meal, ask someone new to join you. Maybe this is someone in your residence hall, or someone in class. Maybe you choose to venture out and try a new dining location. Group fitness classes at the RPAC are a fun way to get exercise. There are a bunch of different types of classes, and you can find one you are interested in through the Recreational Sports website. Just like class, get there a couple minutes early to introduce yourself to someone new. There over 1,200 student organizations on campus. Find one you are interested in and plan to attend a meeting. Many student organization accept new members any time throughout the year. This is a great way to find people with similar interest as you. Still not feeling connected? Reach out to me or to any Peer Leader in First Year Experience–we want to help you find your fit at Ohio State!